Adjunct Professor at the Foreign Policy and Security Faculty of the University of Łódź, graduated from the National Security Faculty at the National Defence University (2007), former intern at the “Young Leaders Dialogue” programme, organised by the Department of State (2010-2011), Associate Professor in Lithuania, Slovakia, Turkey, Ireland, as well as at National Cheng-chi University in Taiwan (Taiwan Fellowship Programme 2013). 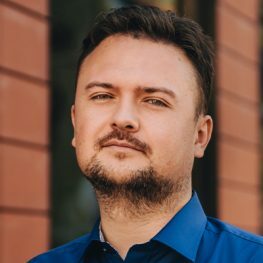 He cooperates with numerous newspapers and magazines among which „Polska Zbrojna”, „Nowa Technika Wojskowa”, „Lotnictwo”, „Stosunki Międzynarodowe” and „Military Technology” as a journalist. Analyst of IHS Jane’s (Jane’s Information Group) with regards to the Armed Forces.